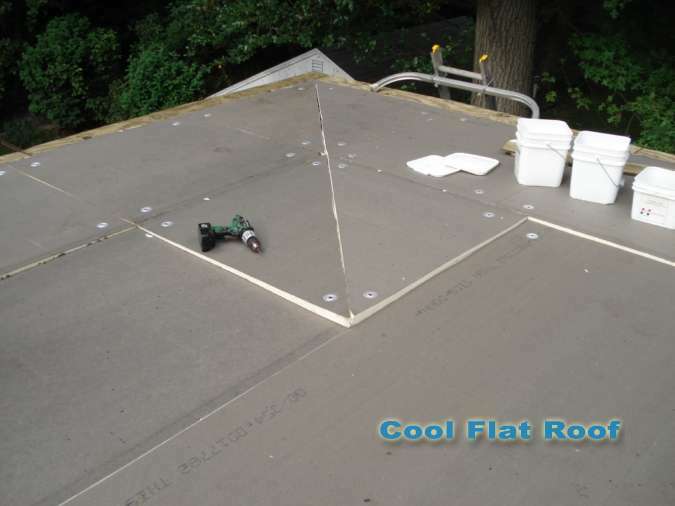 Flat roof installation sequence and the way different components are put together can oftentimes be quite confusing. We also get many questions about particular aspects of how roof details work in different situations. Our Roof Installation Guide will answer these questions and demonstrate the step by step process of installing an IB PVC flat roofing system. We welcome any questions you may have – you can ask them in the comments section at the end of this article. 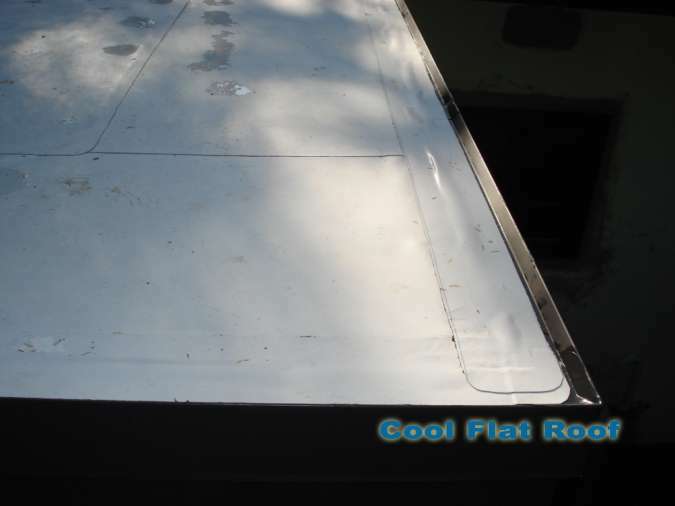 Installing a flat roof (PVC single ply roofing membrane in this case) can be a pretty straight forward process, or a very confusing endeavor, because each component must be installed in a particular order. Otherwise the system may not work the way it should. Of course there is an installation spec manual from IB roofs, which we always keep handy, and actually had to use once or twice. However, this manual only shows particular flashing detail or a general way of how the membrane and insulation ought to be installed. It can’t possibly cover all the specifics of the roof installation that come up in the field. PVC Roofing is a very durable and long lasting flat roofing material. However it should never be in direct contact with any oil and asphalt (also oil) products. Since most other roofing materials are made with oil or asphalt, we always install a protection layer between PVC membrane and either old roof or the roof deck. We usually use insulation to protect the membrane from being in contact with asphalt and also from deck fastener punctures. Roof insulation also serves its primary purpose of improving thermal insulation properties of your roof. Before we install insulation though, we first install a perimeter wood nailer that serves as a rigid nailing base for the PVC-coated drip edge. Once wood nailer is in place, we lay out the insulation sheets and fasten them to the roof deck, using FM Global 60 or 90 mph wind rating standard – 8 or 10 plates + fasteners per 8×4 feet insulation board (although this is unnecessary, since it is a mechanically attached system). Once the wood nailer and insulation are in place, we install one or more rows of perimeter half sheet, which is a 3 foot wide roll of membrane, vs a standard 6 feet width for field rolls. The perimeter half sheet is installed to prevent wind uplift, and is fastened either 12″ o.c. or 6′ o.c. (for high wind areas). 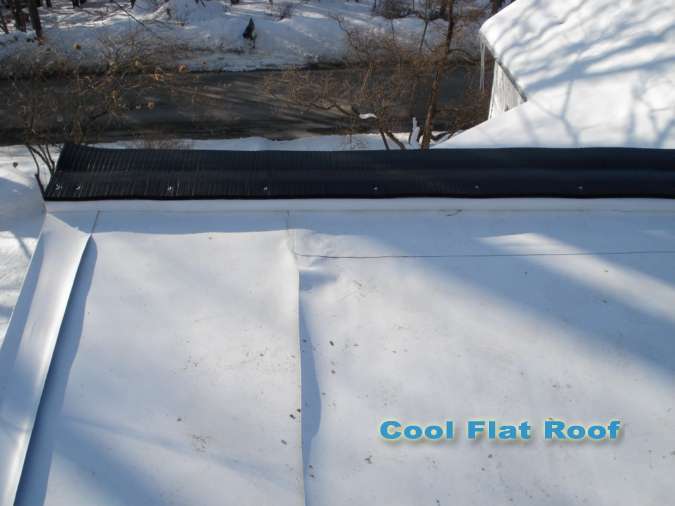 If there is a ponding water situation, the fastest and most cost-effective way to solve the ponding is to install a so called tapered insulation system, which creates slight roof pitch, which helps divert the water in a required direction and improves roof drainage. Tapered insulation is basically the same thing as extruded PolyISO insulation with a fiberglass facing. The only difference is that tapered insulation is wider along one edge and narrower along the other. A tapered insulation system can have a roof slope ranging from 1/8″ per one foot run, to 1/2″ rise per one foot run or more. A reinforced PVC single ply roof allows installers a choice of installing the roof in a fully adhered assembly (sheets of membrane glued to the insulation) or a mechanically attached assembly, where each sheet or roll of the roofing material is screwed to the roof deck substrate with heavy duty, corrosion resistant fasteners, and barbed plates. Each roll is screwed to the roof deck on one side, and then the next roll, overlaps a row of screws, and is welded to the first roof, right next to the screws. Then the process continues in the same manner, until the whole roof is covered by the membrane. 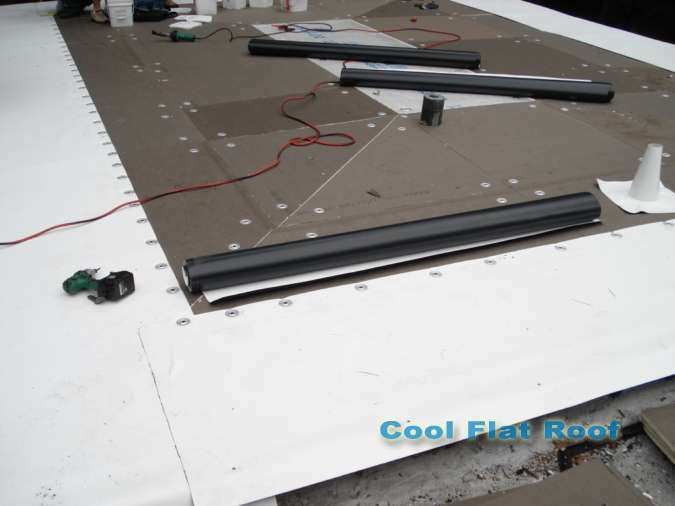 As you can see in the roof installation picture above, the narrow roll of membrane is installed around the roof perimeter and wider rolls are in place, and are ready to be installed. However, before you get to this point, there is a lot of prep work that has to be done first, and the actual membrane installation is the easy part. Normally, we use a 1/4″ tapered insulation system which raises roof level 1″ for every 4×4′ insulation piece. As we mentioned the perimeter half sheet is installed along roof edges, and fastened on the inside with screws and plates – what is holding the half sheet along its outer edge? Well, this is the question that homeowners often ask me. The way IB PVC roof system is designed, allows us to attach the outer edge either directly to the drip edge or run in over the roof edge by a couple of inches, nail it to the fascia board and install a drip edge metal over the membrane. Both ways are acceptable, but most of the time we use the second method – especially in high winds area. Once the roofing material is installed and flipped down, over the edge of the roof, we install 10 foot sections of 22 ga PVC coated galvanized or stainless steel drip edge, and fasten it to the deck with the roofing screws, either 12″ or 6″ o.c. Then we weld a 5″ wide cover strip of the membrane to the roof and to the drip edge, to seal the screw holes and bake the whole detail water-tight. Once the 10-foot sections of drip-edge are installed, the joins are sealed using an aluminum tape and a PVC patch to mack the joint water-tight and protect the patch from metal expansion and contraction. After the joints are complete, the cover tape is welded to drip edge starter and the roof itself, and its now time to do the rest of the roof. As a side note, there are many options for drip edge detail. Although the most used drip edge is the 2 or 3″ wide face, white starter, you can also choose it to be as much as 8 or more inches wide, as well as in gravel stop style (if you need to divert the water flow or prevent it from going over the edge of the roof. Gravel stop drip edge has a 1″ bump-out, which stops water from spilling over, and makes it run down the roof – toward a drain or a gutter. Drip edge comes in two colors – white and dark bronze, and also can be painted any other color with acrylic paint. IB roofs also offers 16 oz. copper drip edge, with PVC material adhered to the flange, and can produce any style drip edge, with different angles, kick-in or kick-out face and in various widths. After all edge detail is complete, we install the field rolls of membrane and all penetration flashings, such as pipes, drains, HVAC / Skylight curbs, roof hatches, chimneys, etc. IB Roof Systems produces a wide variety of flashing accessories, which allow installers to quickly and easily flash almost any roof penetration. Since all roof components are made of PVC, they are all welded together, and the use of any adhesives or glues is completely eliminated, as well as most installation errors by roof mechanics. All curb and up-the wall flashing is installed using a two-step process. First, the roof is terminated that the wall, and then a separate piece of membrane is installed up the wall and welded to the roof. After the flashing is installed and welded to the roof, the inside or outside corner flashing is welded to make a permanent watertight joint. All IB flashing accessories are made of 60-mil non-reinforced flashing membrane and can stretch to perfectly adhere to any shape of a penetration on the roof. Pipe flashings and drains have a reinforced flange to be welded to the roof. As you can see in the video, the roof penetration flashing is a very clean process, and a chance of a leak is minimal to none. 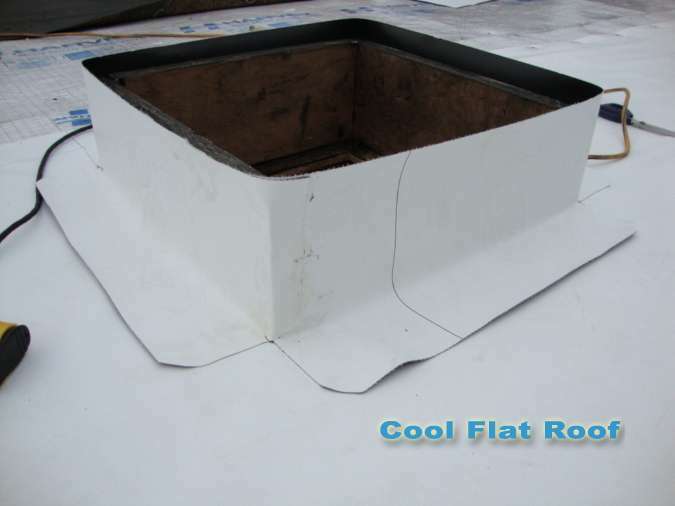 Unlike flashing details on a rubber roof, where a membrane cannot and should not be terminated at the base of the curb, due to high possibility of a leak caused by adhesive failure, the hot air welding process used in sealing overlaps and seams on a PVC roof, eliminates leaks, as well as membrane pull-out caused by contraction of the roofing material in cold weather. IB roof spec manual does not cover all installation details, as in the real world you often run into situations where you have to “improvise”, while your roof must still be watertight. One such example is the ridge vent detail on flat / low slope roofs such as shed dormers. While many low slope roofs are considered “flat”, they were built as sloped roofs with ridge / soffit ventilation in mind. However, many roofing contractors that install EPDM rubber roofs, block the ridge vent opening completely to prevent roof leaks. We’ve developed a special assembly method, which allows us to still use the ridge vent, and keep the roof watertight. We run our roof up-to the ridge opening, weld additional strip of membrane, install a 2×4 wood to raise the level off the roof, flip the strip of membrane back and wrap the 2×4 with it. This prevents wind driven water from penetrating the roof, and ridge vent + ridge cap is installed on top, 2 inches up. As you can see, IB PVC roof can be adjusted to virtually any type of flat roof, and roof penetrations. We recommend that you check out more roof installation videos on our Roofing Videos channel on YouTube. 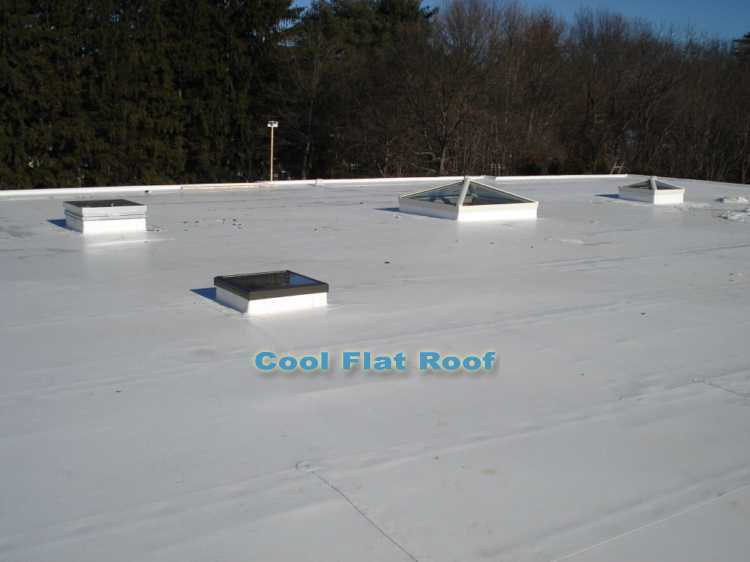 You can see more examples of flat roof installations that we have done all over New England: Roofing in Massachusetts and roofs in Connecticut. 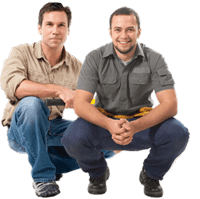 We provide residential roofing and commercial roof installation services in all New England states. However most of our work takes place in MA, CT and RI. Also, if you have a flat roof deck that is leaking, check out our roof deck section, to learn more about IB roof installation on flat roof decks, patios and balconies, using special slip-proof roofing material called IB DeckShield. This looks like a more efficient way to do roofing. Right now we have tiles and with the fierce winds we are always replacing them. I would love to get something like this installed and see how it does. In my early years 300% elongation was like the magic number. Now shred the tires, either using a sharp knife or a shredder. roof for damage or loose and leaky gutters. How would you handle porch railing posts? The installers I talked to maked pith pockets, although a rep for FiberTite said pitch pockets are outdated and prefers to go UP with the flashing, not down. Would it be best to go with round pipe where the flasing is and transfer to 4×4 post above? Wow your installer is very professional. I have been using TPO membranes on all my new roof installations, but only because I cannot find anyone that will sell me PVC. I have a Durolast roof that has held up very well but is probably going to be due for replacement soon. I am going to do more calling around to see what I can find in the way of PVC roofing material, I am in Texas by the way and let me tell you it gets HOT working on those roofs when the sun comes out. One TPO roof we had to split the job into two portions (front half and back half). By the time we got to putting the second half on which was about a year later we had trouble welding the new TPO to the old one. I am not sure maybe we did not clean it hard enough or whether there was premature curing like you describe in the videos.